This fellowship will provide a lucky composer with six months of studio space at the Ridgewood Bushwick Senior Citizens Council starting in January and a $2,500 stipend. Artists, musicians, and dancers are always jostling for space to create and rehearse their pieces in neighborhoods like Bushwick where bedrooms and shared spaces are shrinking (and getting more expensive) by the day. That's why Exploring the Metropolis, a unique arts organization, is offering one composer six months of studio space and a stipend by partnering with a local organization willing to welcome artists into their fold. Exploring the Metropolis (EtM) "is committed to resolving the workspace needs of the performing arts community in New York City." Since the composers' residencies began, EtM has provided over 60 composers with over $500,000 worth of studio space and cash support all while bringing music programs to communities all over the city. The new Ridgewood Bushwick Composer Residency will require the composer to provide one free concert or community-based activity to residents of RBSCC: Plaza de Los Ancianos in exchange for evening access to the facility's hobby room. EtM's Executive Director David Johnston adds, "Not only is RBSCC one of the most prestigious multi-service nonprofits in New York City, it's located in an area with a growing, vibrant arts scene that serves both Brooklyn and Queens residents. They're very progressive in their approach to artists and community and we're happy to partner with them to serve both." Applications are due by October 31, and applicants are required to be at least 18 years old and current residents of New York City. 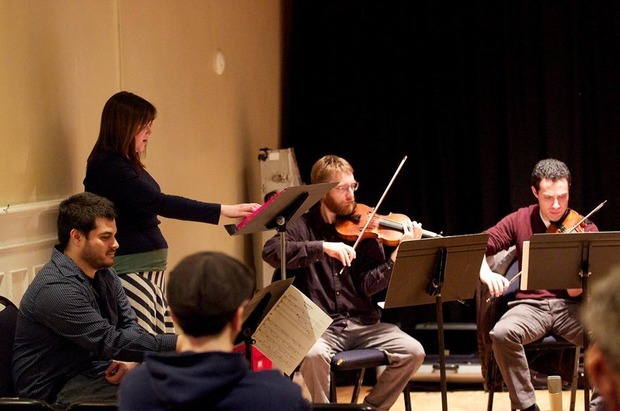 Featured image: Previous performance by a composer in residence, Jeff Myers, Martha Culver, and Jack Quartet. Photo courtesy of EtM's Facebook page.